It’s that time of year again. Resolutions are made. A new start, with a clean slate. We want to make it easier for you, and hopefully help you get you into action. 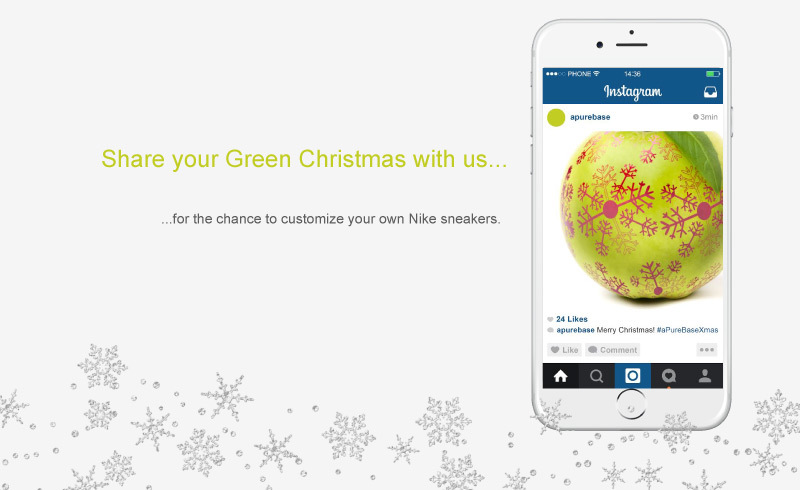 Simply share your Green Christmas with us on Instagram using the hashtag #aPureBaseXmas for the chance to design your own pair of Nike sneakers worth 1 600 DKK. Remember to tag our account @apurebase in your post. Your account should be public, otherwise we can’t see your entries. The contest is worldwide and open to all. The winner will be announced January 8th 2016. Our Share Your green Christmas activity starts on December 1st and ends on December 26tn 2015. The contest is world wide and open to all. Prize: A pair of Nike customized sneakers (value €220). The winner will be announced January 8th 2016. In order to participate in the Christmas activity you must upload a picture on Instagram, using the hashtag #PureBaseXmas. Remember to tag our account @apurebase in your post. Your account should be public, otherwise we can’t see your entries.